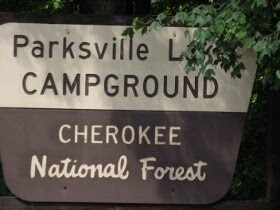 The Parksville Lund Campground is another hidden gem in the Cherokee National Forest. Hubby and I stopped here on one of our weekend drives -- and loved it! Be sure to double check camping supplies before heading out. The closest place to Parksville Lund Campground where you can pick up cheap camping gear is going to be in Ducktown or Benton in Tennessee. Getting to the campground was pretty easy. From Cleveland, TN head east onto Hwy. 64. When you get to the junction of Hwy. 64 and Hwy. 30, turn left and go about half a mile. You'll recognize the campground sign from the photo. I get asked about camping gear a lot. Like most national forests, this campground does not rent or sell camping gear. Campers should either bring it along or buy camping gear in Benton or Ducktown. Don't forget to pack your swimsuit and extra towels. The Parksville Lund Campground is about a half-mile from the beaches of Parksville Lake. You will also want to pack comfortable sneakers or hiking boots. There are miles upon miles of trails to be hiked. Mountain biking is also allowed on some trails. Pods that range from 5 – 30 people. There are flush and vault toilets and a dump station. Want to know what's even better than the above? The Parksville Lund Campground has blissfully hot showers! And, if you don't want to drag out the camping gear, then don't worry. The entire area is fun for a day trip. When we were there, the Ocoee River was ablaze in colorful rafts and kayaks. Roadside pull-offs upstream from the Ocoee Whitewater Center are perfect for watching them rush by. We made the obligatory stop at the whitewater center to pick up postcards, refreshments and souvenirs. The volunteers inside the center filled a bag with enough information to guarantee that I will return. Sharing with you is a bonus. Highways and 64 and 30 are scenic, the whitewater center offers Olympic history and the Parksville Lund Campground is shaded and quiet. My list of places to return is expanding.